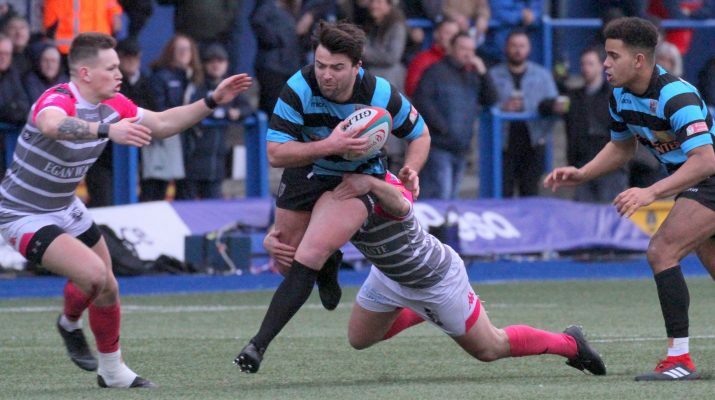 Cardiff RFC beat close rivals Pontypridd for the first time in 20 games across all competitions to kick off 2019 with a try bonus point bang at the Arms Park. The opening 10 minutes was a scrappy affair as both sides tried to get on top, but handling errors and breakdown penalties prevented either team gaining any sort of momentum. In the end it was the visitors who got on the scoreboard first when Ben Jones dissected the posts after Will Rees-Hole was penalised on the floor, however the fly-half would leave another three points out there shortly after before Gareth Thompson drew the scores level on the 20 minute mark. Jones would go on to miss one more penalty and a third kick, this one a conversion after Pontypridd had powered over the line thanks to a driving maul from close range with Chris Dicomidis the beneficiary, as the visitors left eight points on the tee. That came back to bite the Valleys side on their backside, especially when Alex Knott spilled the ball a yard out from the line after a Jones chip over the top under pressure from Ed Howley at full-back for Cardiff. Pontypridd got the ball back for one last attack in the first half, but as the clock turned red a well red defensive blitz saw Gareth Thompson take an interception on a plate and sprint under his posts, converting his own score for an unlikely 10-8 half-time lead for the Blue and Blacks. A hugely important try on the stroke of half-time and Cardiff would capitalise on that at the start of the second period as well. Thompson added a penalty before a well worked backs move saw Thompson and Rees-Hole combine in midfield to release Howley on the outside. The full-back drew the last man and put Joe Gatt over with a free run into the corner. The successful conversion extended the lead, but just as it seemed Pontypridd were losing ground they battled back in fortunate circumstances. A lucky bounce allowed Alex Webber to reclaim the ball in the opposition 22, before Cardiff over-chased a loose pass and Alex Knott was able to slide underneath two defenders to score. However, the Blue and Blacks didn't let this phase them as they hit straight back, with slick hands from Tom James once again releasing Howley on the outside. This time he looked back inside and found Lewis Jones who crashed over for a third home try. Cardiff didn't look back this time, with Jones going close again a few minutes later, before Jim Botham had a try ruled out for a knock-on, but in the end the pressure built and Rhys Carre powered under the posts from close range. That would end the scoring at 34-15 with 25 minutes to go, before what was perhaps the most pleasing aspect of the game, especially if you are Cardiff RFC defence coach Gethin Jenkins, as the home side kept Pontypridd at bay for the rest of the game. Even as first Shane Lewis-Hughes for infringing on the floor, then Kieron Brown for infringing at the scrum and finally Morgan Allen for a deliberate knock on saw yellow, the 12-men of Cardiff stood strong to see out the game. You have to go back to 2009 for the last Cardiff win over Pontypridd in any competition, with Steve Law no doubt chuffed to get that monkey off the back of his team and close the gap on the rivals to just a point and retain third place in the Premiership. Cardiff Blues will also be pleased, as the likes of Rhys Carre, Shane Lewis-Hughes, Ben Thomas and Tom James put in good performances, while Jim Botham continued his return to match fitness. Up next for the Blue and Blacks is a trip to Tata Steel, as the WRU Cup gets underway in Port Talbot on Saturday.